Der E 50 Ausf. M ist ein deutscher mittlerer Panzer der Stufe 10. Das deutsche Heer forderte bei der E-Serie die Verlegung des Getriebes in den hinteren Teil der Wanne. Damit eine schnelle Entwicklung möglich war, nutzten die Ingenieure bei E-50 und E-75 den Antriebsstrang aus Tiger II, wodurch die rückwärtige Unterbringung unmöglich war. Der E-50 Ausf. M war eine Neuentwicklung des E-50-Projektes mit hinten liegendem Getriebe. A tier X medium that actually has armor other tier Xs should pay attention to, the E 50 M is a spearhead and sniper tank that is comfortable both staying back and picking off hitpoints at will, or getting into the face of (or simply around) isolated or overconfident opponents. A consummate master of flexibility in battlefield roles, the E 50 M allows the expert player to flow smoothly from one task to another, and thus, allows other tanks to do their supposed jobs properly in order to attain victory. Der E 50 Ausf. M markiert das Ende seiner Linie deutscher mittlerer Panzer. Strong, near pinpoint accuracy only outmatched by the Grille 15 and Leopard 1. Good accuracy during movement which allows doing snapshots. Tough upper plate and above-average side armor which can provide very lucky bounces if properly angled. Rear transmission makes it less prone to engine fires from frontal hits. Very high top speed, although usually only achievable when going downhill. Poor damage per minute for a medium tank and slow turret traverse makes brawling hard. Very large in size, even larger than some heavy tanks with very poor camouflage rating. Maneuverability poor despite high hp/t, feels sluggish and has poor terrain resistances even on hard terrain. Vulnerable areas - lower frontal hull and turret face are lacking in protection and ammo rack is very weak. Somewhat poor front gun depression (only 6 degrees). The E 50 M is an effective German tank but a teensy bit cumbersome compared to its peers. The E 50 M, like all other tier 10 mediums, fires APCR as its default ammo. Aside from price, it keeps all the characteristics of APCR, this is both a good and bad thing. APCR achieves its higher penetration potential in reality because it concentrates all the kinetic energy on a smaller point, and because it leaves the barrel at a much higher velocity. In game it's the same, and perfect for the E 50 M's playstyle. The combination of a fast traveling shell and extremely accurate gun makes hitting moving tanks at extreme ranges practically a walk in the park. When supporting and sniping from the far rear is not an option, the E 50 M is still quite home at close quarters engagements. The "good" all around armor will prove difficult to overmatch except by the largest of gun calibers, and can therefore be used to bait tanks into being shot at extreme angles. Even smart players might think they can get through, but if done correctly their shells will simply bounce due to sheer angles or autobounce entirely, leaving them open to a quick and accurate counterattack. Having smooth ride and snap shot, in addition to a Vertical stabilizer and vents can make the E 50 M arguably the most accurate medium tank even when moving, giving you a noticeable edge. However, despite the good armor, the E 50 M is still not completely comfortable at close range. Other lower profile medium tanks can simply hug you and due to E 50 M's poor gun depression and large size, you will not be able to fire back at them. You can get close, but only about arm's length at best, point blank brawl matches are best to be avoided, tempting though they may be with such a powerful engine. But, it is worthy to note that with a properly trained driver, the E 50 M can be made to turn nearly as fast as the Obj. 430 in standard conditions, off road driving can also enhance its agility. On the down side, the E 50 M's armor profile isn't perfect. The turret and lower front plate are the prominent weak spots. The front of the turret has a high armor value, but barely any slope, meaning most guns it comes across can penetrate it. And as per the norm of German tanks, the lower front is exposed and relatively weak. It can be expected that almost every time, shots will penetrate the lower front unless the enemy is a light tank or firing high explosive ammo. In addition, although the E 50 M has very good accuracy and penetration, the damage per minute is sadly the worst in its class. Every other tier 10 medium has better DPM which they can use to pump out damage even faster. However, at range where said tanks might miss a lot, the 50 M still has the upper hand. One more thing to note, is that while the E 50 M sports mediocre or bad gun depression on the front (-6 degrees), it gets much better towards the side, where it can depress its gun 8 degrees. This takes some getting used to as you need to angle your armor to maximize your gun depression, but it's a very valuable skill to learn as you will learn to both minimize exposure and get the most out of your tank. In all, the E 50 Ausf. M is an above average medium tank. It's got average speed and average armor, a high penetration gun with laser like accuracy and good aim time and accuracy spread, and a usable amount of health. Up close or afar, you are never really out of this tank's killing zone. The Entwicklung series, more commonly known as the E- series, was a late-World War II attempt by Germany to produce a standardized series of tank designs. There were to be standard designs in six different weight classes, from which several specialized variants were to be developed. This was necessitated by the extremely complex tank designs that had resulted in poor production rates and mechanical unreliability. The E-series designs were simpler, cheaper to produce and more efficient than their predecessors; however, their design involved only modest improvements in armor and firepower over the designs they were intended to replace, such as the Hetzer, Panther G or Tiger II, and as such represent the eclipse of German armored vehicle design by such tanks as the American M46 Patton, the British Centurion Mk 5/2 and Soviet T-54 tanks, which would have been the Entwicklung Series' contemporaries and likely opponents. 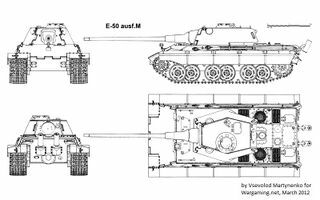 The E-50 Standardpanzer was intended as a standard medium tank, replacing the Panther and Tiger I and the conversions based on these tanks. The E-50 hull was to be longer than the Panther; in fact it was practically identical to the King Tiger in overall dimensions except for the glacis plate layout. Compared to these earlier designs however, the amount of drilling and machining involved in producing these standardpanzers was reduced drastically, which would have made them quicker, easier and cheaper to produce, as would the proposed conical spring system replacing their predecessors' complex and costly dual torsion bar system. The Ausf. M version of the tank was a redesign of the E-50 project with a rear placement of the transmission. Other significant improvement from the base E-50 version is the thickness of the turret front armor, that has been raised to 185 mm. As indicated by its name, the weight of the E-50 would fall between 50 and 75 tonnes. Its maximum speed was planned as 60 km/h. Only blueprints were made; no production models were produced. While there was a proposal for the E-50 with rear transmission, there are no known records of its concept design. No indications of its armor, armament or performance characteristics exist. Diese Seite wurde zuletzt am 7. August 2018 um 10:50 Uhr geändert.